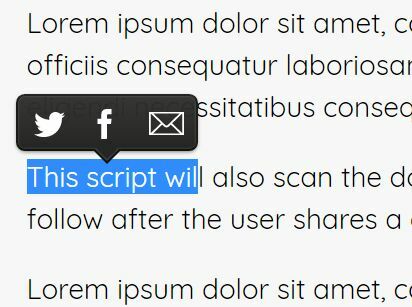 Shareable Quote is a simple lightweight jQuery plugin that turns any part of your text into “Tweetable” quotes with a Twitter share icon. Useful for encouraging your visitors to spread your content through Twitter. 1. Load the shareable-quote.css stylesheet in the head section of the document. 2. Load Font Awesome 4 for twitter icons. 4. Call the plugin to highlight the text and make it Tweetable. Now the display text and tweet text are separate attributes. This awesome jQuery plugin is developed by blakecscott. For more Advanced Usages, please check the demo page or visit the official website.